a large, powerful, or violent whirlpool. a restless, disordered, or tumultuous state of affairs: the maelstrom of early morning traffic. ( initial capital letter ) a famous hazardous whirlpool off the NW coast of Norway. Well…I’m no where near Norway, but the first two definitions are fairly appropriate to the state of affairs in my house. I’ve been working hard all week to crack this nut and although I am by no means completed, I am feeling hopeful. I will get it done! But that doesn’t mean that I can’t participate in What I Ate Wednesday…that fabulous food maelstrom that happens weekly over at Peas & Crayons, led by the lovely Jenn! Though I haven’t really gotten into snack and treats all that much, the most obvious reason being that if I have them around, I’ll eat them…here’s WIAW from the Maelstrom (just love using that big word…which I looked UP! So excited that it actually meant what I thought it meant!! 😉 ) My food is sort of a combo of various days but I guess that’s what I usually do! Sunday breakfast always seems to be an egg sandwich on a sandwich thin. Enlivened up here by some sriracha and a Smiley!! Topped with just a touch of Locatelli cheese…that’ll liven up anything! Why dirty a bowl when there’s just about a 1 cup serving left in the container?! Topped with LOTS of ground black pepper and sweet pickle relish…if you think this doesn’t look good, then…Sorry, but you’re Wrong! It’s delicious! 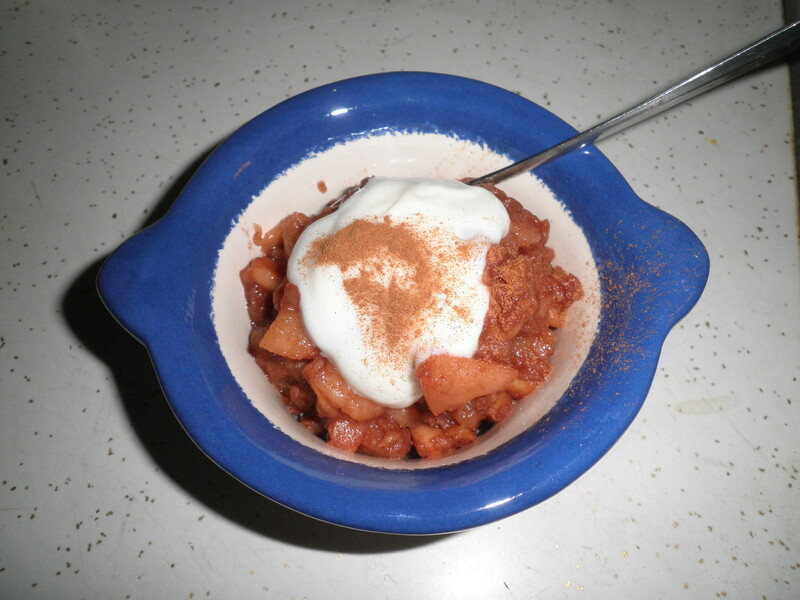 Crock pot apples topped with plain fat-free yogurt and a bit of cinnamon. So delicious. I’ve got to get to work on the bag full of apples I got earlier in the week. I’m so excited!! These are just delicious! A yummy early lunch from Monday. When Ralph goes for his bi-annual (I looked it up and bi-annual is right!) doctor’s appointment we always stop at a particular diner that serves me this plate of deliciousness. 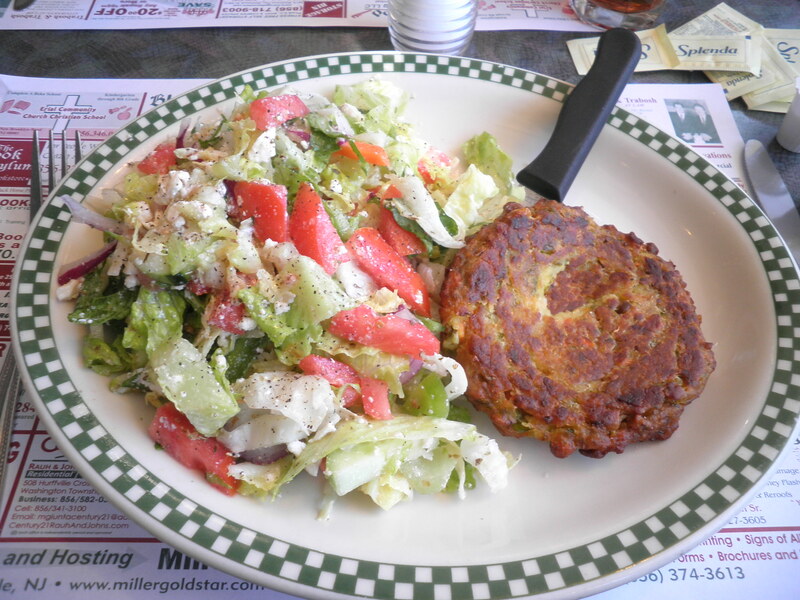 It’s called an Athenia burger plate and is meant to have Greek salad and a regular burger. They’re happy to swap in a veggie burger which is so good, I’ve asked them for either the recipe or where they get them. They will give me neither… 😦 Wish I could find the answer to that question! This is just the right amount…very satisfying. Monday night’s dinner was another of my odd combos. In the spirit of cleaning up and cleaning out…I’m doing the same thing with my freezer. I found some Morningstar Farms chicken-ish strips. They were in great shape, but the broccoli I found was in less than stellar condition, hence it doesn’t look very green. Made a quick batch of couscous. While that was plumping, I sautéed onion, garlic and red bell pepper, my last, I really need to get to the produce market! When that had cooked a bit, I added the chicken-ish strips and the broccoli which was really a freezer burned lump, but it added volume! Added some veggie broth (which I need to tell you all about soon) and just before it was finished I added a half cup of cottage cheese for some extra protein and cheesiness. Topped it all with some Locatelli cheese. This was so good and very filling. I love these bizarre combos that I come up with! That’s What I Ate Wednesday for me today! Be sure to check out all of the fun over at Peas & Crayons and remember to leave a comment…well…because we Love them! I continue with my grand project and I must say I’m feeling good about it. Keep tuning in and I’ll keep updating you! Go eat something Delicious! 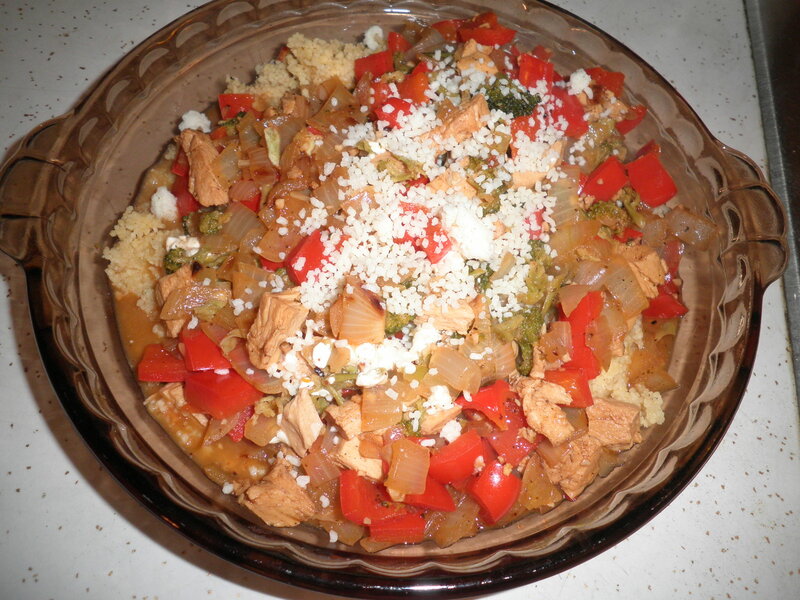 This entry was posted in Uncategorized and tagged crock pot, fruit, salads, WIAW. Bookmark the permalink. good luck with your day, fran! onwards and upwards! “cottage cheese in the container” -> very funny, and i totally relate! it does give a deep sense of satisfaction when you confirm a word’s meaning,,,and you were right! thank goodness for google before we hit “publish” on our blogs! You’re so right Cathy! I use dictionary.com. So many times I’m not sure how to pronouce a word and they have a little button that you push and you hear it pronounced. Lots of time, it’s not what I think. 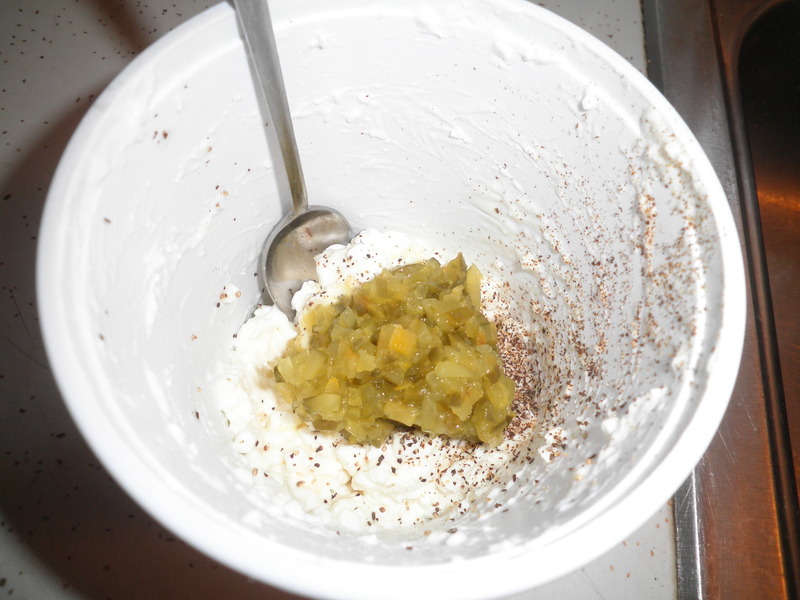 Regarding the cottage cheese…as I said…why dirty a bowl!!! Have a great day! Looks like a great food day! I hope you have a great rest of the week. Thanks, Diane! I work hard to stay on track…some times I do…then there are times! 😉 Hope you have a good week too! 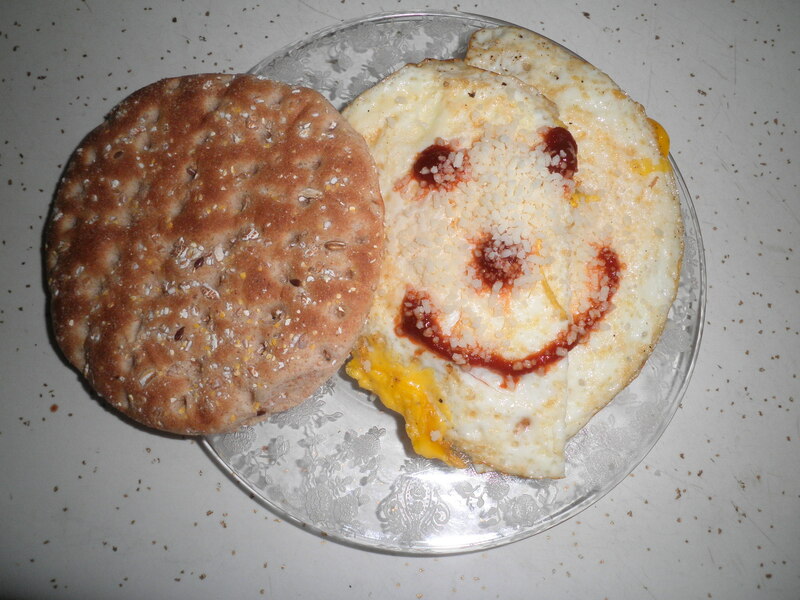 I love the smiley face sandwich – fun touches like that always brighten up the day! Haha, dictionary.com has been my savior many, many times:) No lie. Hi Kelsey! I love dictionary.com! As you say…it saves my neck ALL the time! Thanks for visiting, stop by again! Allie, cottage cheese with relish is something I got from my Grandmother…she gave it to us all the time. The black pepper was my addition! I think I was losing my mind on Sunday when I made that sandwich!! Awww I love your sriracha Smiley!!! haha so cute, Fran! Glad you like my smiley, Liz! Got a little crazy with that! I’ve done that cottage cheese (or large carton of yogurt) trick…I totally missed out on the fact I could spin it a la oats in a jar! Zo, see what happens when you look up a word! I really should do it more often! When it comes to the big container thing…isn’t that why they created iced tea spoons?! That’s what I use!! I can’t believe that they won’t tell you where they get the veggie burgers from! Isn’t that illegal? I thought that it was some kind of rule that, if asked, restaurants had to give up where their food came from. Humph. Well, it looks delicious all the same. Jennifer, I do have a problem of having snacks in the house. Some nights especially are tricky. Last night was one of those. Elle, that’s it…undercover…I’ll get a job as a waitress and then see what I can snoop out!! There are times that I feel like I have a Norwegian whirlpool in my house…might be a good idea…it could sweep away all this STUFF!! CCITC…I like it! !